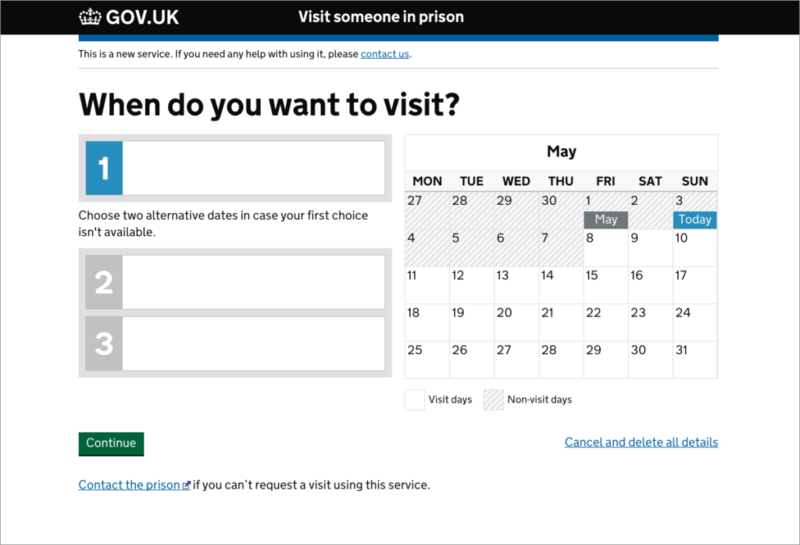 Whilst at the Ministry of Justice one of the key projects I’ve worked on is the online service to allow people to book visits to see their friends and relatives who are currently serving time in prisons across England and Wales. 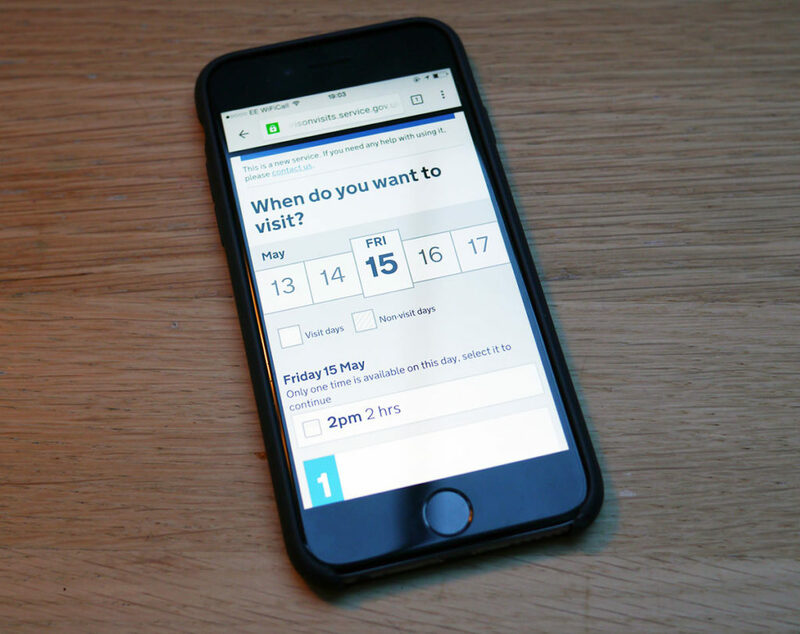 There was considerable room to improve the user experience since, prior to our service launching, people were often waiting for hours to get through to unreliable booking phone lines or having to remember to book their next visit whilst on their current one. I worked as part of a multidisciplinary team that was led by a product manager, supported by a delivery manager and featured a researcher, content designer, technical architect and developers. The project began with a discovery phase that saw us visit prisons across England to meet prison staff, visitors and prisoners too. This gave us invaluable insight into the users of the service, both public and internal to the MoJ, and we then started to concept and prototype ideas that were then taken into the Alpha phase. During this phase we tested the prototypes of the service extensively in several prisons and iterated it each time based on the feedback. 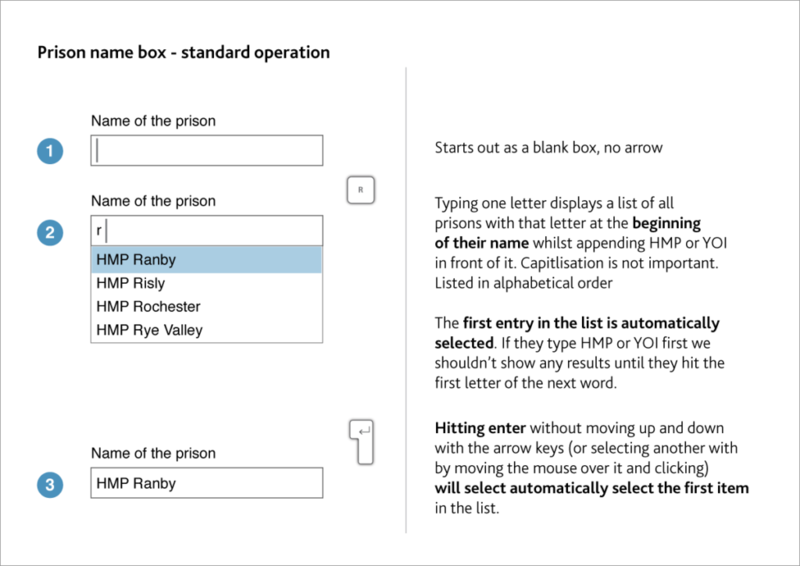 After passing the GDS Alpha assessment we began trialling the service as a public beta in more prisons, repeating the cycle of test and iterate until we were ready to have the live assessment and roll the service out to the majority of prisons. 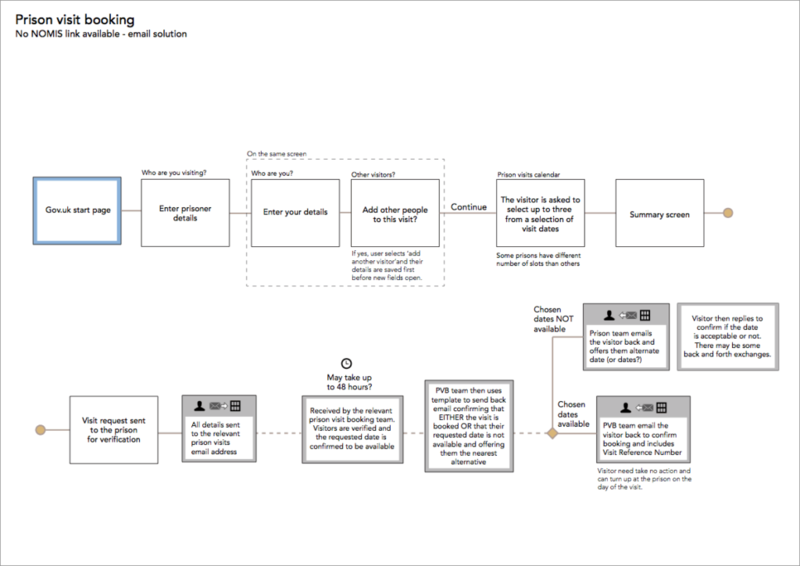 This is the user flow for the email version (no database link) of the service that was created in 2013 but still holds true today. 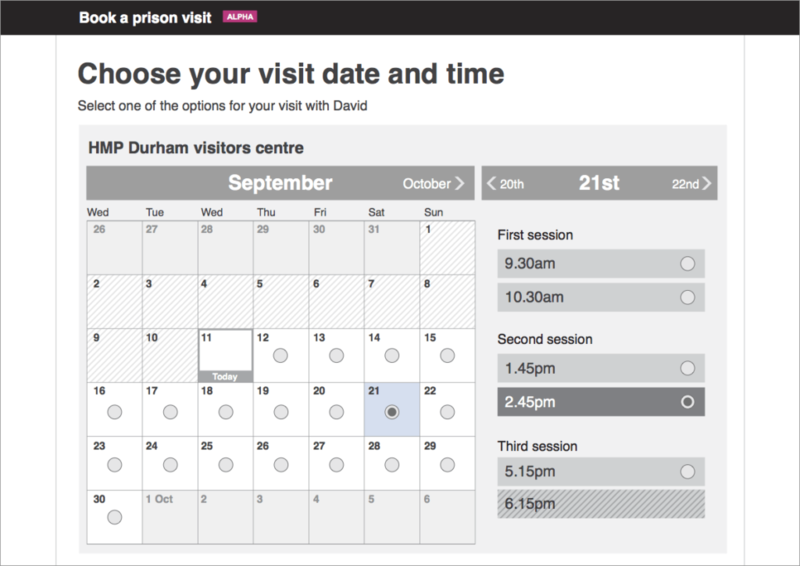 This is one of the earliest versions of the first screen ‘Who are you visiting?’, which was used in early testing with prison visitors and staff. 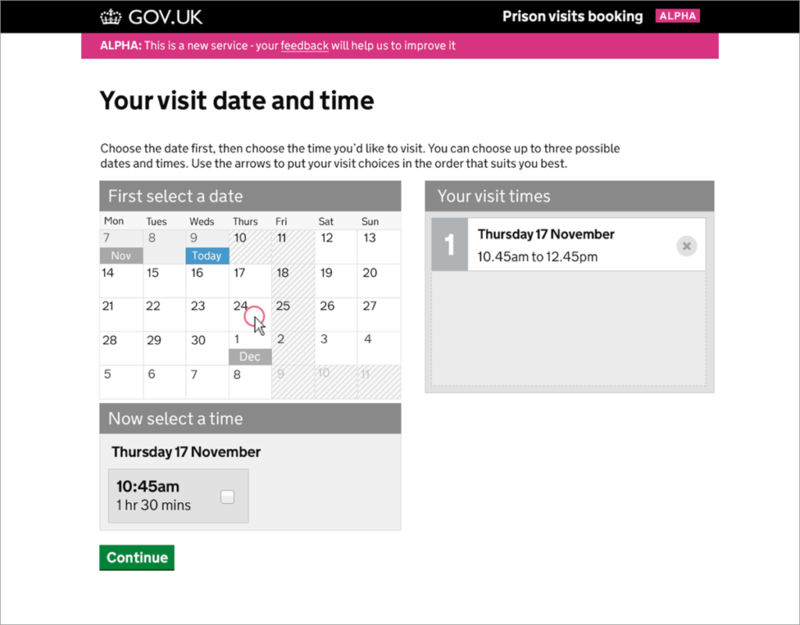 One of the toughest UX challenges was for the date-picker page because we didn’t have the API available (for the first version) that allowed a live connection through to the UK-wide prison database. This meant that we couldn’t offer users guaranteed day and times and had to give them three choices, from which it was likely that at least one would be available. This is one of the earliest versions of the date-picker screen that was to evolve multiple times before the service went live. An alternative design for the date-picker screen that was created and tested with users during the Alpha phase. This one was designed more like a calendar with the full month on display. This is a screenshot from a user testing video that was one of many captured during development of the service. In this case our user researcher Nicole was testing the mobile version of the site. I’ve obscured the face of the participant. This is a version of the date-picker from later in the Alpha phase that is the result of multiple user testing sessions and iterations. It’s notably different from designs earlier in the project. 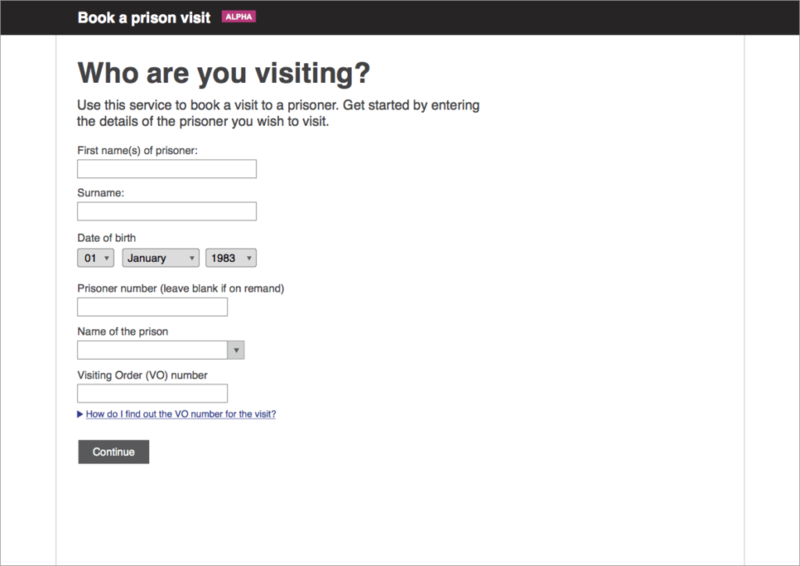 One element of the service was making sure that the visitor selected the correct prison that the prisoner is located at, which takes place on the first page. This was part of an interaction guide I put together for the rest of the team to understand how the prison selection field should work. This is how the datepicker looks in the current live version of the service. Note how it differs from previous versions. This is the result of countless user testing sessions and iterations to make sure it’s as user-friendly as possible. The site is fully responsive and the date picker changes to a more mobile-suitable version at lower screen sizes. 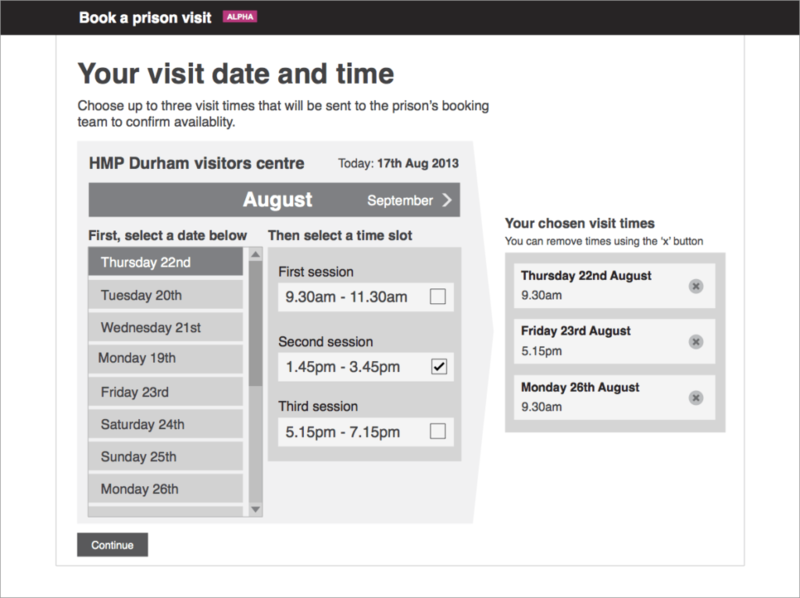 As of May 2015 the service has been used to book almost 350,000 visits to prisoners and, rather impressively, around 62% of these were made via a mobile device.